A while ago I received a call from Arnie Driver in South Australia. He’s into his nineties but is still very active though he can’t walk far these days so he uses a mobility scooter, also known as a Gopher. The travel range of the Pride Legend scooter, powered by a 35 amp hour battery, needed to be extended and solar power was the obvious solution. 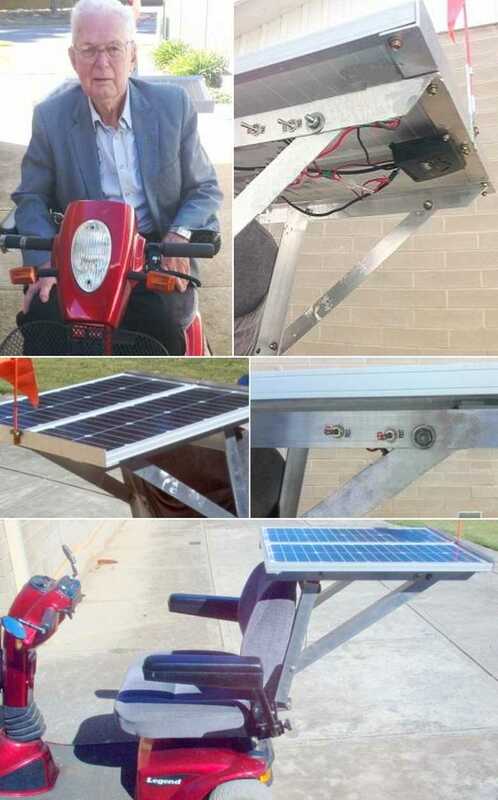 The scooter battery is 24 volt so he needed 24V solar power, but 24 volt solar panels are too large for the Legend scooter, its overall width is about 70cm, so he decided that two 12V 20 watt solar panels wired in series to give 24 volts would be the way to go. Each 20 watt solar panel is 60cm long by 30cm wide and two solar panels placed side by side would be 60cm wide, just right for the scooter. To make the support frame Arnie chose 40mm by 40mm by 3mm thickness aluminium angle, he could have used narrower 25mm angle as the solar panel frames are only 23mm thick but reasoned that the added stiffness of the wider angle meant he would not need cross braces. Initially the frame was positioned higher above the seat to double as a sunshade, but tests showed It made the gopher unstable, so Arnie moved it to a lower position behind the seat backrest. Two Powertech 12V 20 watt solar panels connected in series to make 24 volts. Steca 12V/24V 6 amp solar regulator to regulate the battery charge. Two on/off switches, one to isolate the battery and the other to isolate the solar panels. The two 12 volt solar panels are connected in series to double the voltage to 24 volts and then connected to a 24 volt Steca solar regulator which then controls battery charging. Two 590mm end braces joining the two panels, one at the front and one at the back across the width of both solar panels, fixed to the solar panel frame with self tapping screws. The flag is attached to back one. Two 660mm horizontal braces fixed to the end braces, one under each of the solar panels, fixed to the solar panel frame with self tapping screws. Be careful when using self tappers in aluminium, don’t over-tighten or it will strip the thread. Two 460mm vertical braces bolted to the back of the seat backrest placed 60cm apart, the width of the two panels and fixed with self tappers to the horizontal braces. Two 550mm diagonal braces bolted to the vertical backrest braces and horizontal braces using 6mm nuts and bolts.